2018 Jewish Studies Week at the University of Alberta will feature a special lecture by Dr. Peter Sabo on November 5. Prof. Jan Grabowski will present the annual Toby and Saul Reichert Holocaust Lecture on November 7. (Edmonton) – Jewish Studies Week will be held at the University of Alberta starting November 5, 2018. 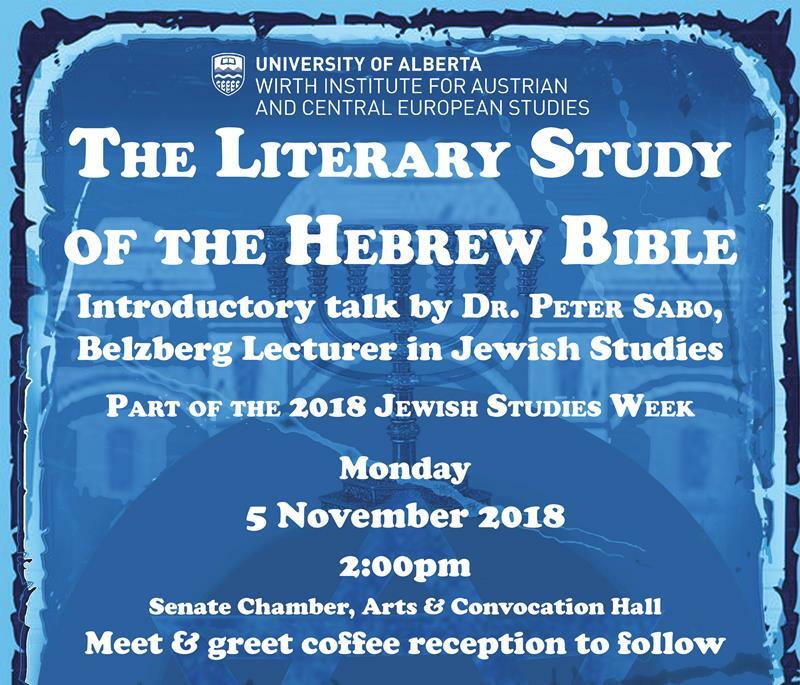 A special introductory talk by Dr. Peter Sabo, University of Alberta Lecturer in Jewish Studies will be held on Nov. 5 from 2 – 3 pm in the Senate Chamber (326), Arts & Convocation Hall, University of Alberta. The theme of his lecture is “The literary study of the Hebrew Bible” and light refreshments will follow the lecture for a casual meet and greet session. Dr. Peter Sabo is the Belzberg Lecturer in Jewish Studies at the University of Alberta. He specializes in the literary study of the Hebrew Bible. His dissertation “The Lot Complex: The Use and Abuse of Daughters in the Hebrew Bible,” explored the shared themes, patterns, and intertextual links in biblical daughter stories, and analyzed how they both affirmed and problematized the patriarchal ideologies of the text. He is also co-editor (with Andrew Gow) of “Tzedek, tzedek tirdof: Poetry, prophecy, and justice in Hebrew Scripture” (Brill, 2018), a Festschrift in honour of Francis Landy. Another area of Dr. Sabo’s research involves reception history of the Bible, including its influence on contemporary culture, politics, and identity. In recent work, he examines the influence of the biblical blood prohibition on Jewish, Christian, and “secular” perceptions of animals and eating practices. He is also co-editor (with Rhiannon Graybill) of the forthcoming volume “Who Knows What We’d Ever Make of It, If We Got Our Hands on It?”: The Bible and Margaret Atwood (Gorgias Press). This work ties into his broader interest in method and theory in the study of religion, which he approaches from social and poetic perspectives. 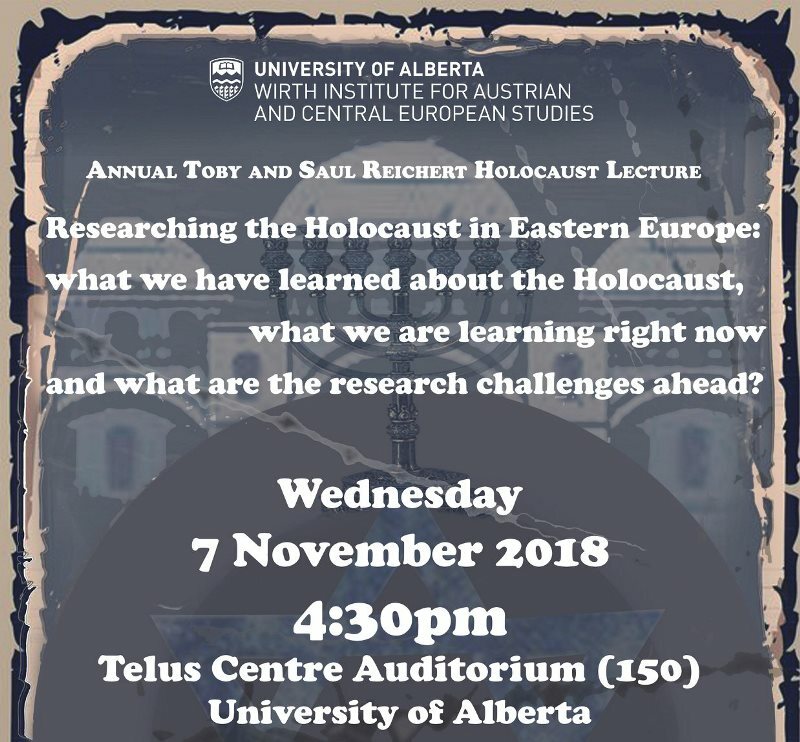 On November 7, the Annual Toby & Saul Reichert Lecture will be held from 4:30 – 6 pm at the Telus Centre Auditorium (150) at the University of Alberta The topic is “Researching the Holocaust in Eastern Europe: what we have learned about the Holocaust, what we are learning right now and what are the research challenges ahead?” with keynote speaker Jan Grabowski, Professor, Department of History, University of Ottawa. Jan Grabowski is a Professor of History at the University of Ottawa and a founding member of the Polish Center for Holocaust Research in the Polish Academy of Sciences. He has been an invited professor at universities in France, Israel, Poland and in the United States. In 2011 Dr. Grabowski was appointed the Baron Friedrich Carl von Oppenheim Chair for the Study of Racism, Antisemitism, and the Holocaust at Yad Vashem, Jerusalem, Israel. He has authored and edited 15 books and published more than 60 articles in English, French, Polish, German and Hebrew. Professor Grabowski’s most recent book: “Hunt for the Jews. Betrayal and Murder in German-Occupied Poland” has been awarded the Yad Vashem International Book Prize for 2014. In 2016-17 Grabowski was the Ina Levine Senior Invitational Scholar in the Jack, Joseph and Morton Mandel Center for Advanced Holocaust Studies, at the United States Holocaust Memorial Museum in Washington, DC. His most recent work:”Night Without End. Fate of Jews” in selected counties of occupied Poland, 2 vols. (Jan Grabowski and Barbara Engelking, editors), was published in April 2018, in Warsaw, in Polish with an English edition forthcoming. For more information about these two events visit the University of Alberta, Faculty of Arts, Wirth Institute for Austrian and Central European Studies. Be the first to comment on "Jewish Studies Week features two special events at University of Alberta: Nov 5 & 7"